Press play to begin streaming the audio interview or right click the text link and choose save as or save link. 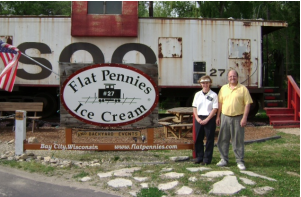 Jim Ross of Flat Pennies Ice Cream has had success running an ice cream business for over 10 years. We had the pleasure of interviewing him and asked what his top 2 secrets are to improving operations and customer satisfaction. Jim recommends having a variety of participants. He often reaches out to teachers, customers and vendors that have a background in marketing or simply have helpful ideas that they want to voice. These groups usually consist of 6-8 participants as lower than 6 can result in not having enough voices while more than 8 can result in the focus group running too long or having too many opinions. 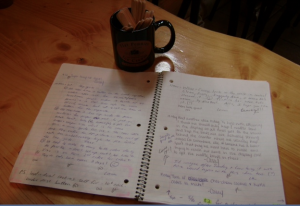 Another great tip from Jim is to have an employee log book. 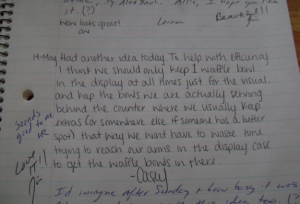 This has helped his ice cream business greatly as it is something that all employees look at and write in every day with suggestions to improve the business or efficiency, comment on the day to day operations, and anything that comes to mind. This opens up communication between the employees and owners and allows everyone to have a voice in the company. The free flow of information results in constant improvements to the day to day operations as well as the business as a whole. Running an ice cream business can be a difficult task at times, however, implementing tips like the two mentioned by Jim at Flat Pennies Ice Cream can greatly improve your operations and in turn improve customer satisfaction. Constantly look for feedback from your employees as well as others who are not directly involved with your business.